Skin lightening and skin whitening both refer to treatments designed for skin pigmentation removal. There is a range of skin whitening treatments, which include laser, IPL & chemical peels used for hyperpigmentation treatment. Skin bleaching is a term that refers specifically to a whitening cream. Hydroquinone cream remains the gold standard for skin bleaching. However, there are other skin lightening creams. These include prescription treatments Vitamin A and over the counter natural alternatives such as kojic acid and niacinamide. I will run through the mode of action of hydroquinone cream and other skin bleaching creams, as well as a brief overview of additional skin whitening and skin lightening therapies. How do Skin Bleaching Creams Work? Skin Lightening Creams that Decrease Pigment Formation. Hydroquinone cream remains the gold standard for skin bleaching and is often used in combination with chemical peels to maximise skin whitening. Hydroquinone cream works by blocking proteins (enzymes) in the skin responsible for melanin production. The two essential proteins are tyrosinase and peroxidase. Other whitening creams act to normalise cell activity or to reduce free radicals in the skin responsible for melanin production. However, most of the skin bleaching creams work by inhibiting these two enzymes. Skin bleaching by blocking the enzymes that produce pigment. There are a series of reactions that lead to hyperpigmentation in the skin. Two essential enzymes information of melanin pigment include tyrosinase and peroxidase. Whitening cream that blocks the action of these enzymes decreases hyperpigmentation. Prescription hydroquinone cream works by blocking the enzyme tyrosinase. It not only decreases the amount of pigment produced in the skin but also helps breakdown existing melanin. Hydroquinone cream is dose-dependent and available in low dose over the counter. However, treatment of hydroquinone 4 per cent and above are recommended. The side effects are also dose-dependent, so our Doctors prescribe combinations of creams to minimise side effects. ochronosis which is very rare but results when hydroquinone cream is used continuously (usually for many years). It appears as a bluish discolouration of the skin but can progress with discoloured papules. For this reason, it is suggested that hydroquinone should never be used long term, and should never be used for greater than three months in any one instance. Naturally derived whitening creams working through tyrosinase system. Arbutin is derived from leaves of different berries such as cranberry etc. It works to decrease tyrosinase effect. Kojic Acid is produced by fungi or bacteria. It acts by decreasing the amount of tyrosinase available to produce melanin. Skin Lightening Creams that Remove Existing Pigmentation. Vitamin A has its skin whitening action by increasing cell turnover and removing existing pigmentation. Similarly, chemical peels, IPL and lasers exert their skin bleaching effect by removing existing pigmentation. It is common to combine whitening creams with therapies such as peels and IPL because they act in different ways to lighten skin pigment. Whitening creams that decrease free radicals. There is a group of skin lightening creams that act by decreasing inflammation. They primarily serve to reduce free radicals. Why does this have a skin whitening effect? Many forms of hyperpigmentation such as melasma and post-inflammatory hyperpigmentation result from skin inflammation, so act as skin lighteners. SymWhite 377 or phenyl ethel resorcinol is an anti-oxidant that reduces inflammation and melanin production. Vitamin C is an antioxidant that acts in multiple ways to decrease pigment production and prevent it being deposited in the skin. Vitamin C can be irritating. Niacinamide is non-irritating, anti-inflammatory. Anti-Inflammatory and decreases deposition of pigmentation. Vitamin A acts as whitening cream by normalising cell activity. Vitamin A topicals such as retinoic acid act by normalising melanin cell activity and decreasing the melanin production. Prescription Vitamin A creams remain the gold standard ( though over the counter retinol also have an impact). For skin bleaching, vitamin A is often combined in a hydroquinone cream. Any skin bleaching regimen should include sun protection. Using hydroquinone cream or whitening creams will have minimal impact unless the skin is protected from the sun. This is important before, during and after skin whitening treatments. applying chemical peels to the skin is another cornerstone of pigmentation treatment. There is a range of peels available, but any that increase surface exfoliation and add in the breakdown of pigment will work. Our favourites include Jessner peel, TCA Peel and vitamin A as these are more potent and potentially work faster. Although any alpha & beta hydroxy acids increase surface peeling these have more potent effects. There are areas of the body that require more care for skin bleaching. There include underarm, between legs and under the breast. Hyperpigmentation develops in these areas from friction. Regular whitening creams are too harsh, and skin whitening with a laser, IPL or chemical peels are not indicated. Special skin lightening creams are available on prescription. Call Us Today On 3350 5447 For A FREE Consultation to Discuss Skin Lightening. There are many causes of enlarged or clogged pores, and the best treatment depends on several factors including the depth and diameter of the oil gland, the number of open pores and your skin type. Prescription vitamin A and BHA are an excellent start to reduce pore size. Acne, enlarged pores, blackheads and whiteheads are all caused by problems with skin pore function and are largely genetically determined. Men and women both get enlarged pores but there is a higher occurrence in men. The underlying predisposition to clogged pores is to do with the amount of oil produced in your skin and susceptibility to the oil gland becoming obstructed. Enlarged pores are caused by overproduction of oil and skin cells inside the pore. The pores become clogged with accumulated sebum and dead cells and slowly enlarge. So treatments to minimise pores should address both of these. Two excellent products to help reduce pore size are prescription Vitamin A cream and over the counter BHA (Salicylic Acid). Vitamin A works in several ways to help shrink or minimise pore size. Firstly it helps slow oil production, and secondly, it helps stabilise the cell turn over. Both of these help to clear clogged pores. Salicylic Acid or BHA 2% is an oil-soluble chemical exfoliant. BHA penetrates into the oil in the oil glands, helping exfoliate the pores on nose and face and improve the cosmetic appearance and minimise pore size. We sell a salicylic acid gel that cost $42 for 118ml. How Long Does Skin Care Reduce Pore Size? Daily application is required, results are a cumulative and long-term reduction in pore size can be expected. However, these will both need to be applied daily to minimise pore size. Several lasers are effective in reducing pore size. Fraxel, ablative erbium and even laser genesis work depending on the depth and skin colour and type. In people with darker skin colour, fractional lasers or radiofrequency such as eMatrix are safer choices. Correct application of skin needling can also reduce pore size. For deeper skin pores TCA peels or TCA cross is indicated. Radiofrequency resurfacing is the best overall technology for pore shrinking results, although combining treatments give the best approach. A microdermabrasion facial can help settle mild acne for clean and bright skin and complexion. It works like a deep cleansing (sucking out and mildly abrading pore obstruction) to resolve pimples, whiteheads and blackheads. The layer of skin that is removed in very fine and consists of dead skin cells that have been adding to pore obstruction and acne, so the surface is not damaged in the process. A series of microdermabrasion facial treatments are required, spaced one to four weeks apart. (Depending on the severity of the congestion.) After each session, you will notice a gradual clearing of obstruction and settling of acne. How Does Microdermabrasion for Acne Work? Microdermabrasion for acne treatment works purely on physical abrasion and clearing of pore obstruction. When combined with other modalities such as extractions and peels the effectiveness of a microdermabrasion facial is multiplied. What Is Involved in a Microdermabrasion Facial? Similar to other facial treatments, a microdermabrasion facial starts with double cleansing and can be combined with peeling agents to help unblock comedones. It is not painful but may leave the skin slightly reddened. Microdermabrasion can also be combined with extraction facials if blackheads and whiteheads are predominant. We offer a range of acne treatments, including Kleresca acne treatment for the treatment of moderate to severe and cystic acne. We offer a free assessment with our dermal therapists for you to discuss your concerns and treatment options. Call Us On 3350 5447 For A Free Consultation. Many people seek a more natural approach to settling cystic nodular acne. Skincare alone, will not settle cystic acne. Neither will dietary changes, nor taking supplements nor essential oils. However, there are more natural alternatives to oral vitamin A and antibiotics to treat moderate to severe, cystic acne. An entirely new blue light activated gel – Kleresca acne treatment. Skincare for Cystic Acne, however, is essential and mostly the same for all grades of acne. Why? Because the underlying cause of acne is the same and the difference with cystic acne is only the severity and depth. No skin care can penetrate deep enough to impact on the cystic nodular components. So the idea is once the cystic acne is settled with Kleresca to provide skin care to prevent inflammation and acne formation. 1.Use an exfoliant, and we do not mean a scrub which can be harsh and irritating. We mean the cosmetic acid exfoliants like AHA’s and BHA’s. 2. Use vitamins A, B & C in skin care. The Anti-oxidant, anti-inflammatory benefits of these three skincare essentials. Vitamin A & C also stimulate collagen to assist in skin repair and help prevent scarring. 3. Use sunscreen to help reduce inflammation and prevent scarring. 1. Exfoliate – to unblock pore obstruction and to encourage skin cell turnover. BHA is the best exfoliant because it is oil soluble and penetrates into the pore to help exfoliate at the site of obstruction. Combinations with AHA especially lactic acid can be useful. Avoid physical scrubs as they can be too harsh. 2. Vitamin A, B & C are core ingredients to help clear and prevent acne. Vitamin A can come in the form of over the counter retinol or prescription retinoids. They have been shown to decrease cell turnover, helping unblock the obstructed oil glands, to reduce inflammation and may help normalise cellular activity. Prescription vitamin A remains the essential ingredient in skincare for cystic acne. It has the added benefit of assisting healthy collagen growth in repairing the injury from nodular acne, helping reduce acne scarring. Vitamin B in the form of niacinamide has anti-inflammatory properties that make it useful for all skin types but especially for helping settle inflamed acne. Vitamin C has antioxidant; anti-inflammatory properties so helps settle acne. Like Vitamin A it has the added benefit of assisting new collagen formation and repair to reduce acne scarring. The critical thing with skincare for cystic acne is the active ingredients that have been shown to benefit. So seeking out skincare that has the correct percentage, is affordable. We offer some in the clinic. For very detailed information on skin that is prone to acne and the best skincare choices, Dr Lesley Bauman provides in-depth skin typing and ingredients according to your skin type. Tea tree oil can help fight cystic acne by applying a drop or two to affected areas. It is well tolerated on the skin and not only helps reduce P. Acnes bacteria but may also be anti-inflammatory. Although small doses of the sun may have beneficial effects of killing P. Acne, sun exposure creates free radicals and inflammation in the skin. Sun exposure can worsen post-inflammatory pigmentation and acne scarring. Use a sunscreen containing Zinc daily as well as hats and avoid the harsh direct sun in peak sun periods. As a temporary measure, which painful cysts are bugging you, apply ice cubes directly for several seconds to help reduce inflammation. The cooling effects of ice can provide welcome, temporary symptomatic relief. It requires a course of 12 treatments At $200 per treatment or $2000 for a package of 12. We do provide payment plan options to assist you in affordably obtaining the therapy. Call us on 3350 5447 to book a free assessment with our therapists or email any queries. Can Reducing Inflammation Clear Your Pimples? Pimple treatment has traditionally used antibiotics in higher doses and for long periods in an attempt to kill skin bacteria. However, the role of inflammation underlying acne and the importance of settling this in treating and preventing acne is a new field of study. A new biophotonic gel, Kleresca, activated by light, works to reduce skin inflammation and is emerging as a promising alternative to traditional antibiotic and oral vitamin A.
Acne is the most common skin condition which causes significant distress both during the active phases and after pimples settle with post-inflammatory hyperpigmentation and acne scarring. Acne lesions form when hair follicles become clogged with oil and dead skin cells. This is a perfect environment for overgrowth of bacteria, with Propionibacterium acnes (P. acnes) being the most common pimple-causing bacteria. It was once believed that pimples and cystic acne were a direct result of inflammation from bacterial infections. Inflammation is the central cause of pimples and cystic acne. And this inflammation is seen in the skin even before a pimple develops. Clogged pores develop inflammation as the sebum is rich in enzymes called matrix metalloproteinases (MMP’s) The bacterial infection then adds further inflammation to form a pimple. Genetic factors, hormones, stress and high glycemic load foods such as sugar and processed (white) carbs bring on zits because they increase oil production and skin cell turnover and leads to sebum-rich blockage in the pores and an environment for P. acnes to blossom. Treating inflammation not only helps acne settle but can also help prevent it from developing. It is, in fact, the anti-inflammatory effects of certain antibiotics and not its anti-bacterial effects that are of most benefit in settling acne and preventing acne scarring. Some common antibiotics inhibit the overactivity of the matrix metalloproteinases. So pimple treatment needs to focus on settling inflammation. The Role of MMP’S Pimple Formation and Inflammation? Matrix metalloproteinases are enzymes that keep the skin healthy by breaking down old and dying skin structures and building new ones. But when they are overactive they cause damage to the oil gland and cellular matrix (collagen-hyaluronic acid-elastin) with the formation of cystic acne and subsequent acne scarring. As well as the antibiotics, vitamin A (retinoids) may also act by inhibiting the MMP’s. Will Acne Settle If The Inflammation is Calmed? Being able to settle the inflammation will settle the acne and help prevent it. So what is wrong with the current medical approach? It is not addressing the principal cause – the inflammation. Both conventional higher dose, prolonged antibiotics and retinoids have side effects. Oral retinoids may increase the risk of autoimmune diseases, and antibiotics disrupted gut health and contributed to antibiotic-resistant bacteria. Perhaps it is time to rethink pimple treatment. Kleresca – A New Pimple Treatment. An alternative pimple treatment without antibiotics or oral retinoids is Kleresca. It is a more natural alternative for treatment of cystic acne and moderates to severe acne. And because it helps stimulate new collagen and skin rejuvenation it is not only a acne treatment, it also treats acne scarring. 3. Antoniou, C. & et al. (in press) A multicenter, randomized, split-face clinical trial evaluating the efficacy and safety of chromophore gel-assisted blue light photo-therapy for the treatment of acne. International Journal of Dermatology. Double Chin is an accumlation of fat beneath the jaw. (Also known as submental fat accumlation). New treatments on the market to treat this concern include cryo-lipolysis and injections. 1. Cryo-lipolysis For Double Chin. Cryo-lipolysis uses a machine to freeze the area of unwanted fat. One or sometimes two treatments are required to reduce under chin fat. Cryo-lipolysis for double chin at SkinRevision costs 630 per treatment. 2. Injection Into The Double Chin. A new injection called Kybella is designed to treat submental fat. This is not available in Australia currently. Most common contributing factors are aging or genetics. Weight gain and hormone imbalances both contribute to double chin. A cold gel covered cloth is placed over the double chin. The small hand piece is placed under the chin and vacuum is applied. This disappears some minutes after the treatment is initiated. Cryo-lipolysis is a treatment that freezes unwanted fat. There is some discomfort during and after the treatment. You can return to work immediately. After the treatment, there can be redness, bruising tenderness or pain, funny sensations to the skin such as pins and needles. As well as the chin, abdomen, hips, thighs, abductors, flanks, knees, arms and buttocks can be treated. 1-3 sessions in the same area every 6-8 weeks. When you have your free assessment the Doctor/ Nurse will be able to tell you how many treatments are required. It is recommended to proceed during 70 minutes for each treatment. This varies with individuals but we recommend 3 months to assess the outcome. We recommend following a healthy low sugar/ carb diet and normal exercising to maintain results. Recent surgery to the area. Medical condition I the neck area. You Inherit Your Predisposition To Health. Each of us is made up of around 24000 genes which you inherited from parents. You cannot change your genes. An example of this in nature is bees. All bees have identical genetic material, but their environment & nutrition determine which genes are expressed. The queen bee in a hive becomes the queen because she is fed royal jelly. But all bees have roles workers, drones, nurses etc. It is the environment which determines which of their genes are expressed and who they become. Simarly with humans changing the environment you and your genes live in. Nutrition, exercise, lifestyle changes and nutrigenomic treatments can change genetic potential, gene expression or provide cofactors to help your cell health. SkinRevision is transforming into a wellness centre. 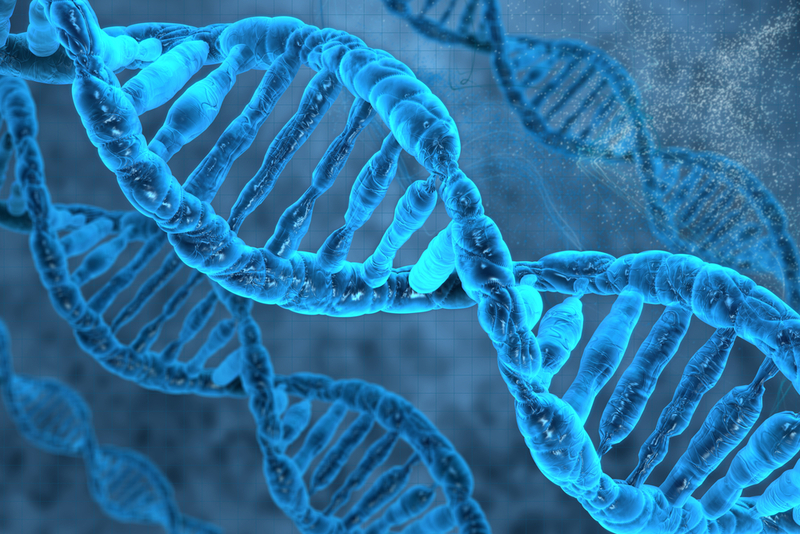 From mid July we will be offering gene testing to help you develop your wellness potential. However it turned out we only have around 24,000 genes. This is a few more than a chimpanzee or a mouse, but nothing spectacular. Even more surprisingly, scientists discovered that large parts of our genome is made up of DNA that doesn’t code for genes. Neck wrinkles & lines develop over time from exposure to sun and muscle movement. The treatment for neck wrinkles and lines depends on the type. Types Of Neck Wrinkles & Lines. 1. Crisscross & crepey neck wrinkles. As we get less young the texture of the skin on the neck becomes more crepey or loose. This can be exacerbated by sun damage. A fractional laser may also have a place. So-called because they look like necklaces. They can occur in younger people. They are caused by movement so can be treated with wrinkle relaxing treatments. Neck line treatment can involve combinations of treatments. Wrinkle relaxing treatments help smooth necklace lines. 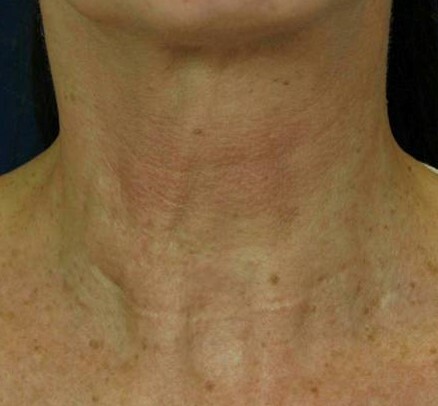 eMatrix- fractionated rf uses radiofrequency for the treatment of neck lines treatment. Vitamin A Creams & Antioxidants improve overall neck skin texture. 3. Cords that stand out on the neck. As some people get less young they notice vertical bands that stand out on their neck. These are called platysmal bands and once again are caused by muscle movement and loss of fat. These develop naturally over time. Best Treated with wrinkle relaxing treatments, called Nefertiti lift. 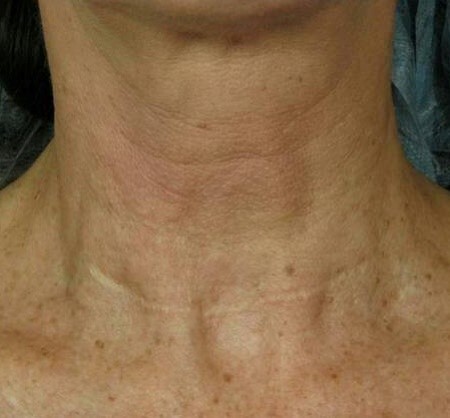 Neck line treatment with wrinkle relaxing treatments does improve the vertical line appearance as well as giving a lift around the jawline area. When considering neck wrinkle treatment always remember preventing further damage is important. The skin on the neck and decolletage often gets more sun than your face. Women often wear makeup or remember to put sunscreen on their face but neglect these two areas. The skin on the neck is also thinner than the face and more susceptible. Wear sunscreen daily on your decolletage and neck to prevent neck lines. You can also extend your vitamin A, exfoliants and other anti-aging active ingredients onto your neck, dec and even hands. Some things that do not work on neck wrinkles & lines. IPL & Laser do not help with neck wrinkles & lines. These are good for skin pigmentation or redness. Microdermabrasion & /Peels similarly do not help with neck lines. Call 3350 5447 For A Free Consultation. Danish research has uncovered a remarkable fact in a study comparing twins. If you ‘look younger’ you ‘live longer’. Happy, confident people live longer. On the other hand people who have stressful, hard, unhealthy lives age faster. For example smoking is an unhealthy life choice that adds years to your face by creating free radicals, decreasing oxygen in your blood leading to more wrinkles. It also means you are more likely to die younger. Stress also takes a large toll on aging, stress causes chronic inflammation in our skin and bodies. This not only makes us look older but can lead to disease. Avoid white bread, pasta, rice, and other refined grain products? They’re quickly broken down into the ultimate white food: SUGAR. This not only causes weight gain, it also ages your face. How Does Sugar Cause Wrinkles? 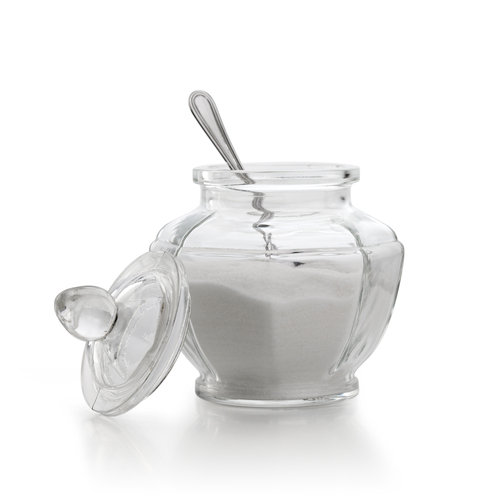 Once in the bloodstream, sugar binds with proteins and creates advanced glycation end products (aptly abbreviated AGEs), which cause collagen to become inflamed and stiff, leading to wrinkles. Focus your diet instead on protein & vegetables. Simple unprocessed whole foods will not only help keep unwanted fat away, you will also have less wrinkles.